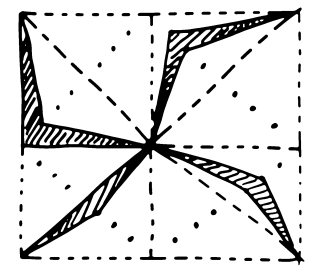 So last time I said that there are lots of ways of dissecting a square into congruent pieces, all of which touch the centre. One of the commentators - PMR - provided an image showing five "classical" dissections (including one I didn't previously have!) and one which could be regarded as potentially valid, but questionable. So what is a valid dissection? 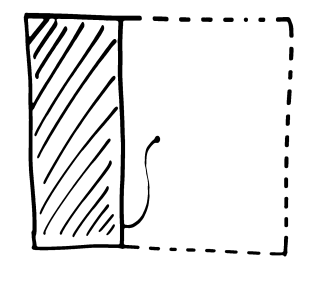 The obvious thing is to think of the shapes we get when we chop up the square. 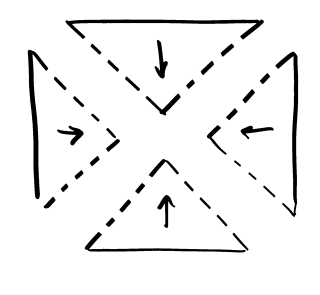 At right is an example where we've cut it into four triangles by cutting along the diagonals. 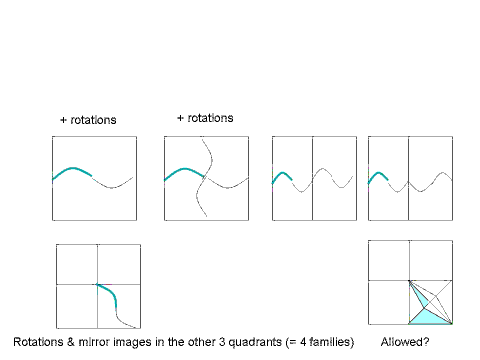 We can put these four pieces together to make the square, but the boundaries get covered twice. We could try not including the diagonal boundaries, but then they don't get covered at all. And even if we include some and not others, there's always the problem of the centre point. We could just say that the fiddly bits don't matter. More technically, we could say that any set of measure zero (effectively anything without area) can be covered twice, or not at all, and we don't care. whose intersection is a set of measure zero. That seems OK at first glance, but a bit of creativity shows a problem. We can end up with a three piece "valid" solution, as shown at right. That doesn't capture our intuition at all. In fact, here's another "dissection". For every point in the upper left quadrant, consider it and its friends under rotation by 90 degrees. Starting with any one of them, colour them clockwise red, green, blue and yellow. In this way each "piece" can be dense in the entire square, by which I mean that every circle drawn anywhere on the square will contain some of each colour. More particularly, the lower right corner can be "touched" by each piece (by which we mean every circle around the lower right corner contains at least one point from each piece). If we then think of this as just the upper left quadrant of a square, and replicate it four times using four new colours each time, suddenly we have a 16 piece solution! But again, it doesn't capture our intuition. Somehow we want or need to exclude the "dust" types of pieces. What if we consider a piece as being the closure of the interior. That eliminates the "dust" type pieces, because they have no interior, and it still allows pieces that have a "cut point". Now we would permit the 32 piece solution, one piece of which is "The Windmill" shown at right. 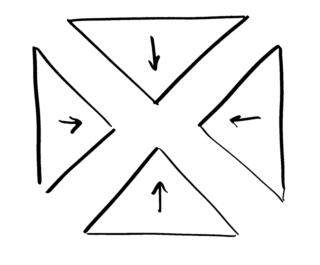 Four "Windmills" in rotation cover half of a square, reflect and we have another four. All eight pieces touch the bottom right corner. Repeat four times around that point and we have a 32 piece solution. But should we allow pieces that have a cut point? Perhaps some people might feel that they are "not true pieces" in some sense. Still we can ask if there are any more, and still I don't know. Proving that you've got them all is a challenge, and not as simple as I'd first thought. That has a better graphic of the 32 piece solution, more links, more examples, and more discussion.